This isn't one of my regularly scheduled posts, and I hope my patrons will be patient with this, as their discussions have inspired me, and I find these thoughts racing through my head, so I need to get them out while it's still fresh. 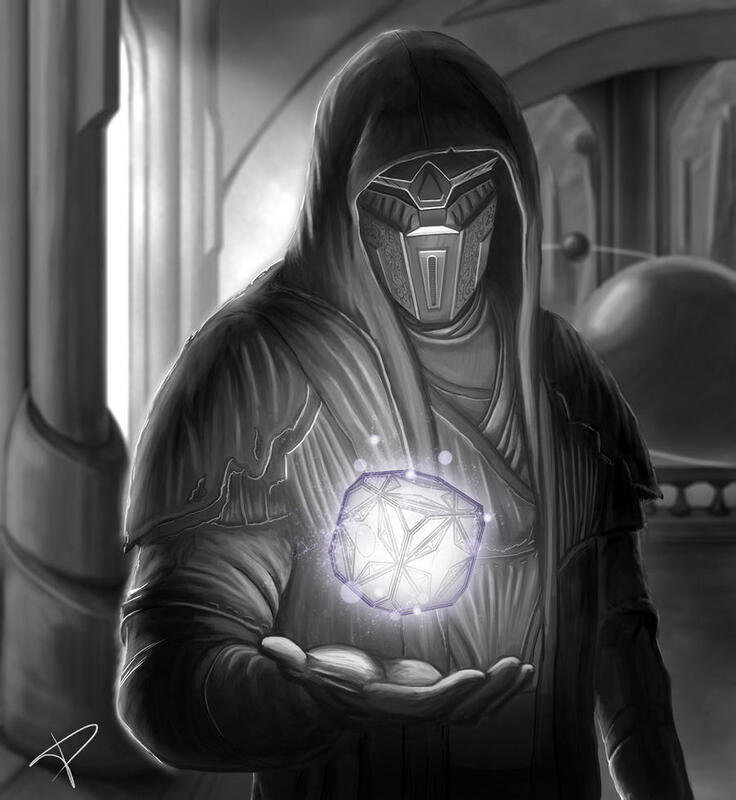 There is a fundamental disconnect between how people who know Psi-Wars talk about Psi-Wars, and what I know for a fact is written on paper and it mostly centers on the Templars. There is this idea that Templars, or other forms of Space Knight connected with Communion, are on a completely separate level from other characters. The see a team of commandos as dangerous, able to take on entire platoons of mooks and win, but a team of Templars should strike fear into the hearts of Imperial officials and threaten to turn the tides of a whole war. However, if you look back at the playtests back in Iteration 4 and earlier, you'll note that Dun Beltain, Space Knight, is not really better than Leylana Grey, a spy, or Kendra Corleoni, a bounty hunter. Yes, they're all cool, but the space knight isn't on a different level. This is a fine and acceptable thing for Space Knights to be. They could be people in armor with one subtle psychic power ("I an sometimes tell when I'm in danger and maybe dodge a little better" or "I can sense when people are sad") and know enough about fighting with a force sword that they can hold their own with other combat templates and definitely take out a bunch of mooks. On the other hand, the super-heroic space knight isn't especially bad either. It depends on what you want. "What you want" is quite a question to ask. You can't even go back to the source material and get a fair answer. Yes, the Jedi as depicted in the prequels are straight up super-heroes (sort of; they rarely really make use of the Force other than as a dramatic display of power; you see far more overt uses of telekinesis than subtle uses of telepathy or ESP), but their power-level in the original trilogy is much more understated. When Obi-Wan defeats the thugs threatening Luke in the Mos Eisley Cantina, nobody freaks out like Clark Kent just took off his glasses, and you might think they would if you pondered the implications of a Jedi suddenly showing up after years of supposed extinction. Instead, they just go back about their business. This makes more sense if you think of Obi-Wan, in his original conception, as more of a wandering ronin in a bar hanging out with a cowboy and a princess and a farm-boy-of-destiny. Obi-wan is not dramatically more special than most heroes in A New Hope, as opposed to Jedi characters in most of the rest of Star Wars, who are on a completely different level. No help there, then. So, it's up to us to decide for ourselves what we want out of Psi-Wars. Do we see Space Knights as "just another character type?" or "setting defining super-heroes?" And the answer seems to be "Yes!" The sense I get is that Dun Beltaine is fine, and we can imagine a lot of heroic aristocratic space knights on a similar power level, but Imperial Knights and Mystical Tyrants and Templars are on a different level. Thus, we have two worlds and two different takes on the game: a modest, "street-level" game and a more dramatic "cosmic-level" game. How do you handle that without making the game unbalanced? Who gets to be epic-tier? Just space knights? What do the epic-tier characters do? The first conclusion I can draw from how people talk about it and the sorts of games I see people proposing or running, or the way in which I see people play, is that, first of all, a lot of people like the street-level gameplay. Not everyone who plays what's a high level character who bestrides the world like a god. A lot of people like playing cool street rats, bounty hunters who struggle to pay the bills, or commandos down in the trenches of the war. It's just that some people also want to be space knights of legend around whom the setting bends, who explore the deep mysteries of the setting. So, we seem to be talking about two separate tiers of play, two different modes of play in the same game. The current templates and power-level are more-or-less fine for the typical street character. What we seem to need is a new level layered atop it for those who would prefer a higher octane experience. This raises the question of what sorts of characters that we see in this higher tier. Are we just talking about Space Knights? That certainly seems to be the case in Star Wars: when it comes to "high level play," whether or not you have the Force determines how cool you are. With the Force? You get to be awesome; without the Force? You're street-level. I have seen a few cases where this rule is broken: Thrawn is sufficiently smart to exist in the same arena as the Jedi, and General Grievous has sufficient cybernetic modification to go toe-to-toe with the Jedi. More than that, though, I always found the "Star Wars is all about the Jedi" to be overly restrictive. It's one of the things I've actively fought against by injecting the Akashic Order and the Divine Masks into the game. Now, we can add witches and oracles into the mix. We also have cyborgs, cool robots, neo-rationalists, and crazy aliens running around. Any and all of these bring their own flavor to the game and I think they should be allowed to operate at this higher tier. Then we must define what it means to be on the higher tier. First, we must answer the question of point budget, and the easiest way to do that is to just write up some templates and see what they cost. We can make some estimates, though. If high tier cost 500 points and low-tier cost 250, then a 50% point ally for a street level character is a 25% point ally for a high-tier character, which is nice. On the other hand, we've already playtested our characters at 300 points and it's pretty solid: it's enough to give us Action-level characters with a bit extra (like being an alien or having cybernetics or one minor psychic power) to fit the conceits of the setting. By the same token, we actually do have a high level character: Vesper Tane 3.0, who is decidedly impressive at 400 points. Thus more than 450 points strikes me as over-kill, and that gives us a 300-450 point range. Is that enough? It remains an open question, especially since those point totals don't create nicely compatible ratios. Low-level characters who go their "the hard way." It might be nice to provide some guidance on what that might look like. Okay, so we have high-level characters. What do they do? Are they just more of the same? Just ultimately better than everyone else? I think that possible, but I also think its fundamentally an unsatisfying option. I think the truth is staring us in the face, as it's an element I've touched on over and over again but never really defined as a truly distinct play element, and maybe I should. Psi-Wars is built on three pillars: war, spycraft and space opera occult conspiracy. The first two have a strong Action vibe to them. They are what a typical GURPS Action game focuses on, and what a lot of Action movies focus on, and they have a pulse: get mission, do some investigating to figure out how best to do it, do it, get screwed, improvise, succeed during explosions, turn in mission. The space opera occult conspiracy stuff, however, seems much closer to GURPS Monster Hunters. This is more like the sorts of things we find in urban fantasy, like the World of Darkness or GURPS Voodoo, GURPS Cabal or GURPS Black Ops. In these, a secret world of violence, horror and monsters lurks beneath the mundane surface that we see and interact with daily, and larger-than-life champions have the secret knowledge to deal with this darker world. This fits nicely with how we see the Templar and why the Templar seems so powerful: he battles mystical tyrants and Eldothic conspiracies and Broken Communion ghosts; what are a few security agents or criminals to him? These have a different pulse: something weird happens (cheerleader gets murdered by a giant beast; people show up dead after losing blood; famous archeologist goes missing); deal with the immediate aftermath and calm everyone down ("Nothing to see here"), then investigate the cause, uncover the monster, lose your first fight, realize their ultimate nefarious plans and learn how to defeat them, then do so, and cover up that it ever happened. As an alternative, they are the nefarious monster, in which case they need to keep their dark deeds from being discovered and they engage in secret wars with one another under the cover of night. This gives us an obvious idea as to what our Templars and Imperial Knights are doing: they are uncovering or creating conspiracies, and Psi-Wars has more than enough secrets to support this sort of thing, but is it compatible with the rest of the game? After all, if you have 4 players who are undertaking a heist and 1 player who is hunting a vampire, can it work? Action is so compatible with Monster Hunters that Monster Hunters has a section on converting Action characters into Monster Hunters. In the end, the pulse isn't that different: both involve investigation and then battle, it's just that Monster Hunters places a deeper emphasis on investigation (and they have differently themed knowledge, with Action more worried about politics and technology while Monster Hunters are more worried about occult, conspiratorial and monstrous lore). This is also the core of Night's Black Agents or Black Ops, which takes explicitly action-oriented characters and reveals a deeper layer of vampires or aliens respectively and allows the players to defeat them. Shadowrun explicitly combines the two, by setting its Action-style gameplay in an Urban Fantasy world. When combined, the pulse tends to be: get a mission, do some investigating, go do the mission, something weird happens that screws you over, you succeed anyway, and the ground has suddenly changed underneath you (your client is dead or a traitor, what you have isn't what you thought it was, etc) and you need to do a deeper layer of investigation to find out what the weird thing is, find the monster, face it, lose, figure out its real mission, figure out how to defeat it, face it again, win, and then figure out what to do with the rest of the pieces. Not every story needs to work like this. A purely street-level game might work like an action game, and a purely epic game might work like a monster hunter game, but we have a clear interface between both levels. It's possible to have bounty hunters and smugglers stumble across a Mystical Tyrant's conspiracy and have a Templar show up to help them. Its also possible, as a bunch of Templars, to run across some spies and commandos who find themselves in over their heads. Thus, our two "layers" are fundamentally compatible and we can navigate between both of them pretty easily. If we're going to create a conspiracy level to the game, really give it the teeth it needs, then we need to do what Monster Hunters does, and define what sorts of conspiracies and monsters the heroes will hunt. We need to define their gameplay. This will also define the power-ups: becoming an epic cyborg commando is not just about adding +200 points of cybernetics atop your commando template. You're entering a higher level world, so you need to have the tools to deal with it: this means your epic commando cyborg might have things like security clearance, secret prototype technology, appropriate Hidden Lore, etc. The problem with the Monster Hunter approach is that Psi-Wars is really nothing like Monster Hunters; where MH is a generic "Monsters be here in the modern world" setting, Psi-Wars is a distinct space opera setting. This is one of the reasons you do space opera, so you can explore unconventional ideas that don't fit perfectly in the classic urban fantasy set-up. So what we need to do is set aside the categories of Monster Hunters (Ghost, Demons, Cryptids, etc) and use our own categories. Fortunately, Psi-Wars has plenty. I've written this most more to sort out my thoughts while it was still fresh. I find this an interesting idea, but it'll be as time intensive as the technological elements I'm working on now, as it involves tinkering with templates and action rules. I think it would be worthwhile, but I also think it should wait. I'll tag these posts "Epic Psi-Wars" so we can find them again later.